After working for 20 years at various companies, shops, and boutiques; I decided to take a stab at things on my own (owed in no small part, to the constant encouragement of my brother). And after working at it now for a few years doing freelance design and as the Creative Director of LEGENDmag, I can honestly say I like it. Granted there are very different approaches one must take to employment—most notably that the more you work, the more money you make (which stands in stark contrast to a corporate job)—but overall it has been good to me. I have learned how rewarding a good day of work can be, and how equally scary a week-long draught is. I have been able to relax at opportune moments, and had to miss out on fun because something needed designing. But above all it continues to be a wonderful learning opportunity, and I plan on continuing it as long as I can. This snapshot is taken of the monorail in Seattle, which connects downtown with the Space Needle and EMP. 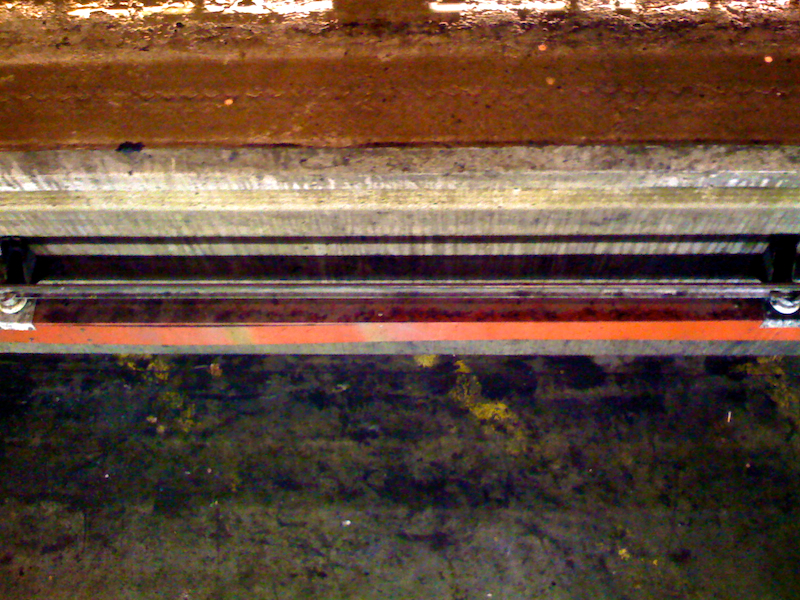 It is actually taken at the end of the line peering straight down into the track, while waiting for the train to arrive. Lovely bands of rusted metal, painted concrete, and mechanical systems; for us to admire and examine, stacked up like a slice of mountainside.